Key grade 5 questions collected by topic. Use the algebra, number, probability, shape, ratio and statistics files as part of revision lessons, starters, end of teaching review quizzes or as home learning tasks. Questions and solutions cover key GCSE grade 5 areas so suitable for crossover students at both higher and foundation tiers. Perfect for either printing or projecting to use in class. Used effectively in secondary Delta Academies. Sets of 20 questions covering topics key to securing a GCSE Maths Grade 7. This resource contains 5 sets of 20 questions . Each set covers the same 20 topic areas so that students can easily demonstrate progress. Can be easily printed as single sheets or as 4 page booklets in A4 or A5. A fantastic resource to use at after school revision, for home learning or in small group intervention sessions. Used effectively across all secondary Delta Academies. Sets of 20 questions covering topics key to securing Foundation GCSE Maths Grades . This resource contains 5 sets of 20 questions . Each set covers the same 20 topic areas so that students can easily demonstrate progress. Can be easily printed as single sheets or as 4 page booklets in A4 or A5. A fantastic resource to use at after school revision, for home learning or in small group intervention sessions. Used effectively across all secondary Delta Academies. Sets of 20 questions covering topics key to securing GCSE Maths Grade 4 . This resource contains 5 sets of 20 questions . Each set covers the same 20 topic areas so that students can easily demonstrate progress. Can be easily printed as single sheets or as 4 page booklets in A4 or A5. A fantastic resource to use at after school revision, for home learning or in small group intervention sessions. Used effectively across all secondary Delta Academies. 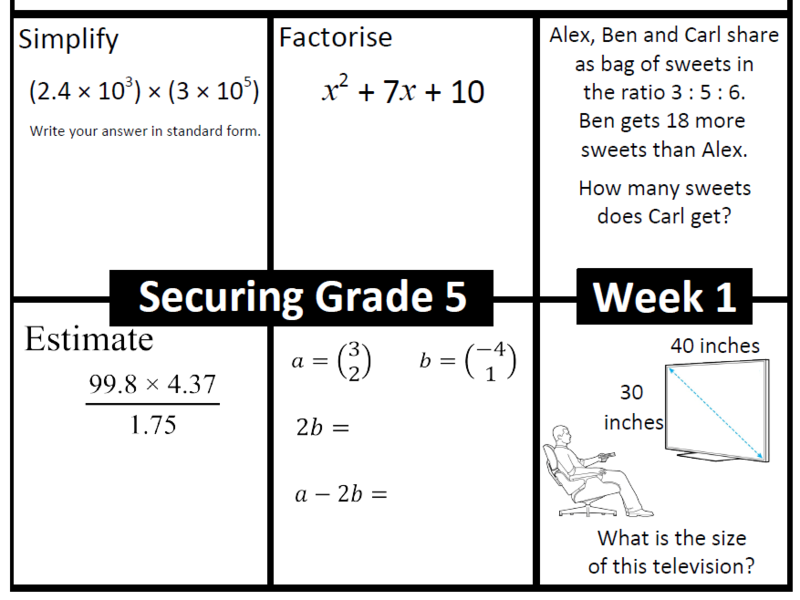 3 sets of lesson starters designed to cover key grade 5 GCSE maths topics. Each set consists of 6 files so that skills can be developed over a period of time. Full solutions are included for each starter. Files are attached as both SMART Notebook and PDF. These are great to use once a week or every lesson depending on what your focus is with your class. These are really effective starters covering topics important to both Foundation and Higher students trying to reach a grade 5. They would also make great revision tasks or tasks for emergency cover lessons. Used effectively across all secondary Delta Academies. 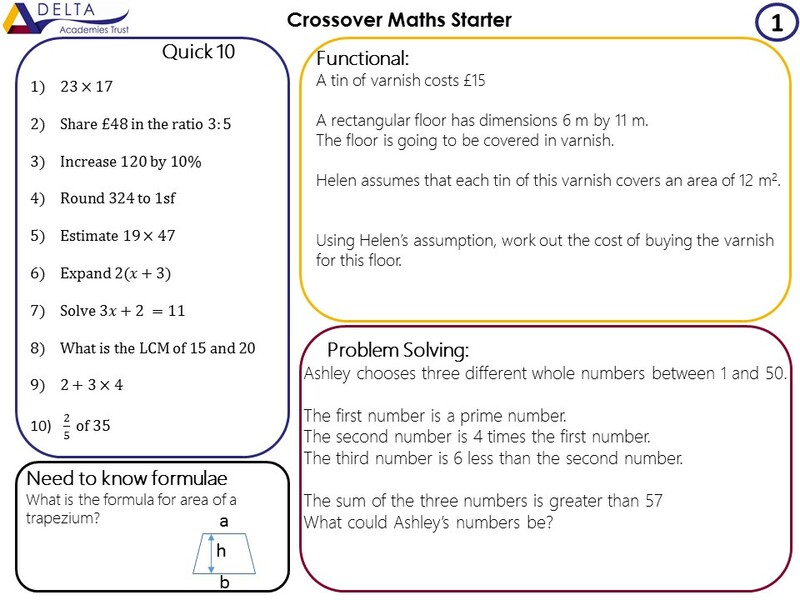 A collection of 22 starter tasks with solutions aimed at grade 4/5 crossover GCSE Maths students. Consisting of 10 quick skill based questions, one recall fact or formula, a functional GCSE question and a problem solving style GCSE question. Perfect starters for revision sessions or to be used over a series of lessons to improve student retention and recall of key skills and exam question techniques. Suitable for both foundation and higher students particularly those around grade 5. Can be printed or projected for use by small or large groups of students. 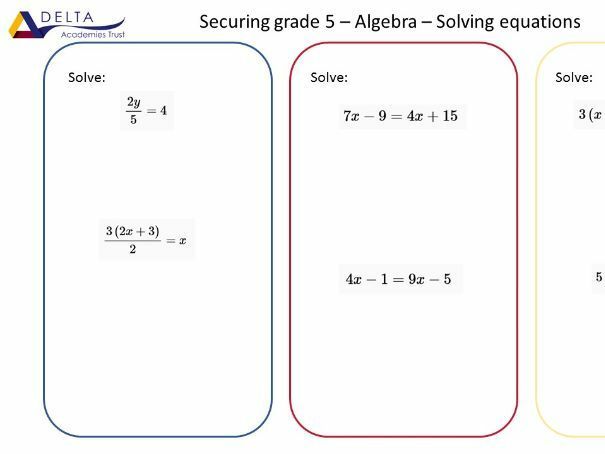 Used successfully in maths departments across all secondary Delta academies. 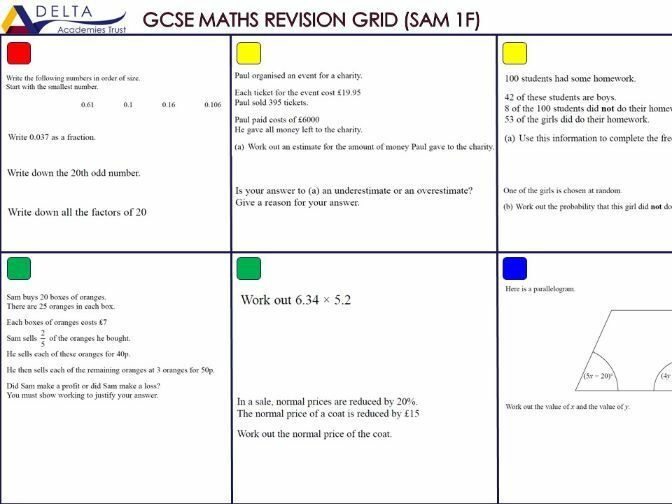 A set of interactive power point files to use in GCSE Maths revision or intervention sessions. Uses selected questions from Edexcel 1MA0 GCSE Maths papers. Perfect as a whole class revision or recall activity particularly using mini whiteboards. 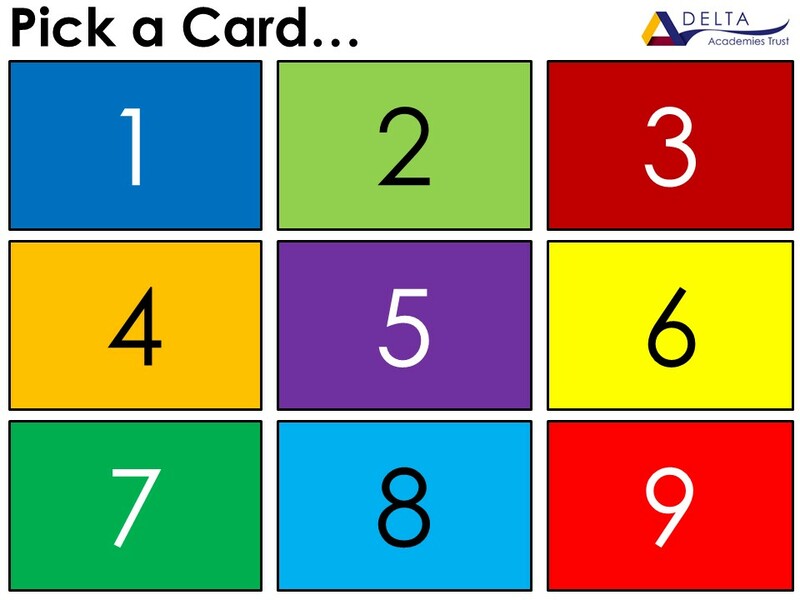 Engage and challenge students to pick up as many marks as they can on the random GCSE question that are hidden beneath 9 cards. Works excellently in all Delta Academies in after school revision or other intervention sessions. Foundation files are aimed at grade 4/5 and higher files are aimed at grade 6/7. 3 sets of lesson starters designed to cover key grade 3 GCSE maths topics. Each set consists of 6 files so that skills can be developed over a period of time. Full solutions are included for each starter. Files are attached as both SMART Notebook and PDF. These are great to use once a week or every lesson depending on what your focus is with your class. These are really effective starters covering topics important to Foundation students trying to break through a grade 3. They would also make great revision tasks or tasks for emergency cover lessons. Used effectively across all secondary Delta Academies. Six key questions covering the whole difficulty spectrum a Foundation Maths GCSE paper. Made from Edexcel 1MA1 GCSE SAM and Specimen foundation papers. Engage and challenge students to pick up as many marks as they can on the on questions that cover the difficulty range of a whole paper differentiated and colour coded RAGB. A perfect starter or 20 minute challenge for a revision lesson. Works excellently in all Delta Academies in after school revision or other intervention sessions.